Note: Please upgrade to iOS 5.0+ for the best Skype experience. Call, video call and instant message anyone else on Skype for free with Skype for your iPhone or iPod touch. Plus call and text your Contacts (or any other number) at Skype's low rates. It's great value with Skype Credit. Skype for iPhone, iPod touch and iPad is free to download and works over 3G* or Wi-Fi. Enjoy video calls with Skype contacts on, iPhone, iPod touch or iPad, compatible mobiles, PCs, Macs or Skype-enabled TVs. Text and call phones anywhere with Skype Credit. It's especially good value to international numbers. Enjoy wideband audio (SILK codec) on iPhone 4S, iPhone 4, iPhone 3GS, iPad and 2nd & 3rd generation iPod touch. * Skype video calling requires iOS 4.0 or above. * Send and receive video using front or rear camera on iPhone 4 and iPod touch 4th Generation. * Send and receive video using rear camera on iPhone 3GS. * Receive video only on iPad 1st generation and iPod touch 3rd Generation. * Works with any H264 compatible devices, including TVs. This version works on iPhone, iPhone 3G, iPhone 3GS, iPhone 4, iPhone 4S, iPad and iPod touch. 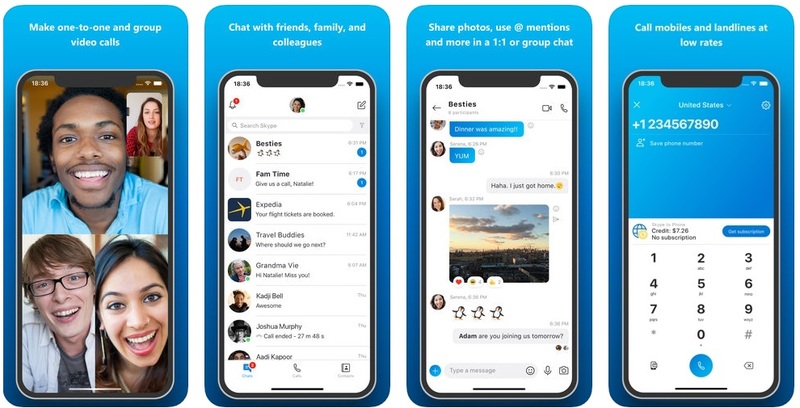 Skype requires iPhone OS version 3.0 or above. Calling functionality is available on iPhone, iPhone 3G, iPhone 3GS, iPhone 4, iPad and 2nd generation iPod touch and later. iPod touch requires a compatible headset with a microphone.